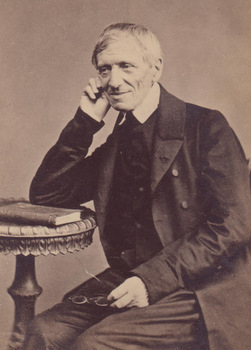 Who really is Cardinal John Henry Newman? Back when I was a student involved in the Newman Centre at Queen’s University, I confess that I knew nothing about the life and works of the centre’s namesake. Now, having spent the past few weeks researching him for Catholic Focus, I’ve learned that it’s not an easy question. A consensus has emerged that Newman truly is Blessed, as he will be proclaimed in Birmingham, England this Sunday. Yet so much ink has been spilt on the question of whether Newman’s legacy belongs to the Church’s traditionalists or its reformers. Pundits from both camps find evidence to claim him as one of their own. Instead of enjoying Newman’s broad appeal, the ideologues will spoil their weekend, fuming over the thought of their opponents applauding the beatification. The rest of us can simply rejoice. And in the mean time, we can learn more about the only person that Benedict XVI has chosen to personally beatify. On tonight’s Catholic Focus, we meet a priest who likely knows more about Newman than most of the commentators combined. As the superior of Toronto’s Oratory of St. Philip Neri, Fr. Jonathon Robinson belongs to the same congregation as Cardinal Newman. He was involved in the launch of Newman’s cause for sainthood in 1958. Catholic Focus airs tonight at 7 & 11 pm, repeating Saturday at the same times. S+L will broadcast Cardinal Newman’s beatification Mass live this Sunday at 5 am (all times Eastern).